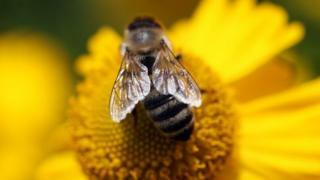 The European Commission says it is Europe's most comprehensive study so far of bee colony deaths. Winter mortality was especially high for bees in Belgium (33.6%) and the UK (29%) in 2012-13. But in spring-summer 2013 France was highest with 13.6%. Bumblebees and other wild bees were not studied, nor were pesticide impacts. The study, called Epilobee, described 10% as an acceptable threshold for bee colony mortality - and Greece, Italy and Spain were among the countries with rates below that threshold. The mortality percentages are national estimates based on representative samples. All 17 countries applied the same data collection standards, the report says. The survey covered almost 32,000 bee colonies. But there is also much concern about death rates among wild bees, which are vital pollinators too. Last year the EU introduced a ban on four chemicals called neonicotinoids which are used in pesticides. They are believed to be linked to the collapse of bee colonies across Europe, though there is a heated scientific debate over the chemicals' impact and many experts say further studies are needed. The Commission wanted pesticide impacts to be included in the Epilobee study, but it was overruled by member states' governments.